baby carrots and a radish. They also took their reusable water-bottles filled with water. I love eating liver, which is a good thing because it is so good for you. And not only that, it is cheap to buy. 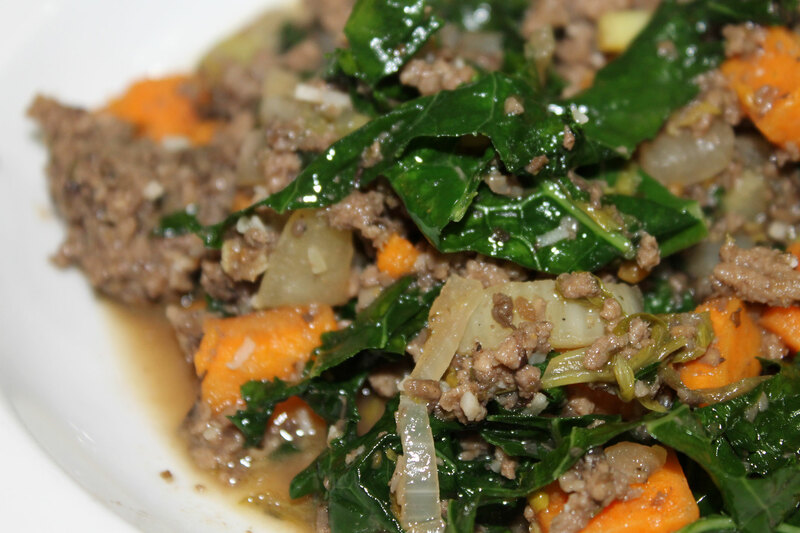 If you are struggling to make ends meet while eating paleo, definitely consider adding more organ meats to your diet. 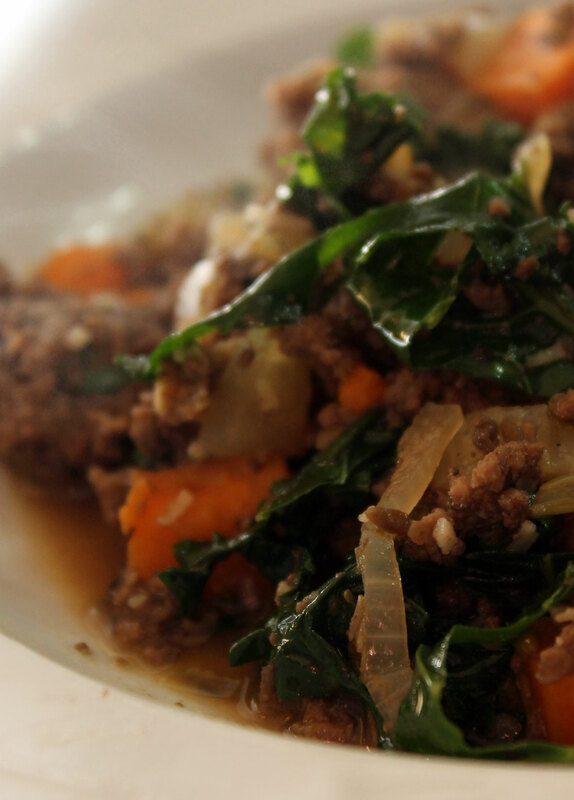 Liver, and especially chicken livers are really economical. I do recommend that you use pastured and/or organically reared chicken liver when possible. Some people express concern about the possiblity of toxins in liver, and think that it is not a good idea to eat it because it is a detox organ. While this is true that the liver does remove toxins from the body, it simply breaks them down so that they can be excreted by other organs. The liver does not store any of these toxins and in a healthy animal is perfectly safe to eat. Liver is one of the most nutrient dense foods you can buy. It is a good source of Thiamin, Zinc, Copper and Manganese, and a very good source of Protein, Vitamin A, Vitamin C, Riboflavin, Niacin, Vitamin B6, Folate, Vitamin B12, Pantothenic Acid, Iron, Phosphorus and Selenium. While liver is high in cholesterol, it has been shown that dietary cholesterol has very little bearing on blood cholesterol (1, 2, 3), and not only that, you actually NEED cholesterol to make a lot of the steroid hormones that your body relies on. Your brain also relies on cholesterol to function There have been studies that have shown that cholesterol is vital for memory. And if you don’t eat enough of it your body will simply make more. 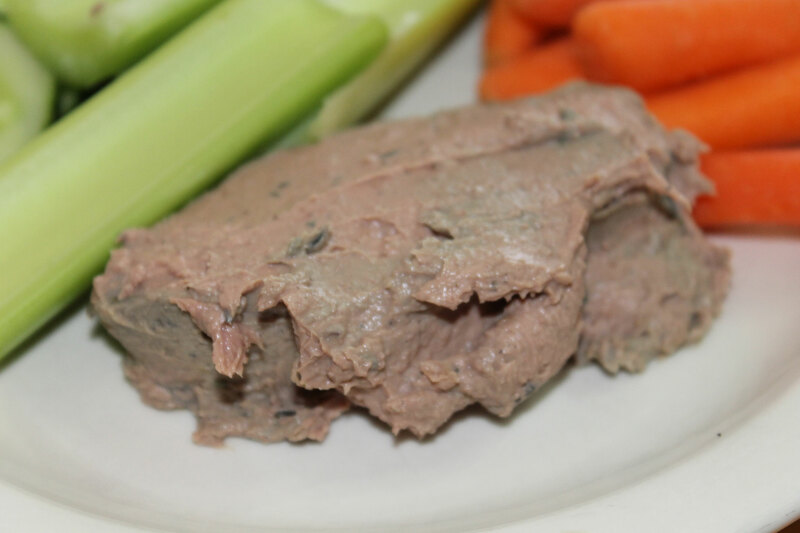 One of my favourite ways to eat liver, especially in the case of chicken livers, is to make a pate. Smooth, creamy and rich, this barely tastes like liver. And making it into a pate, paste or spread removes most of the “ick” factor that people have when faced with a hunk of liver. Instead of that hunk of what is obviously an internal organ, you have this rich, creamy spread. 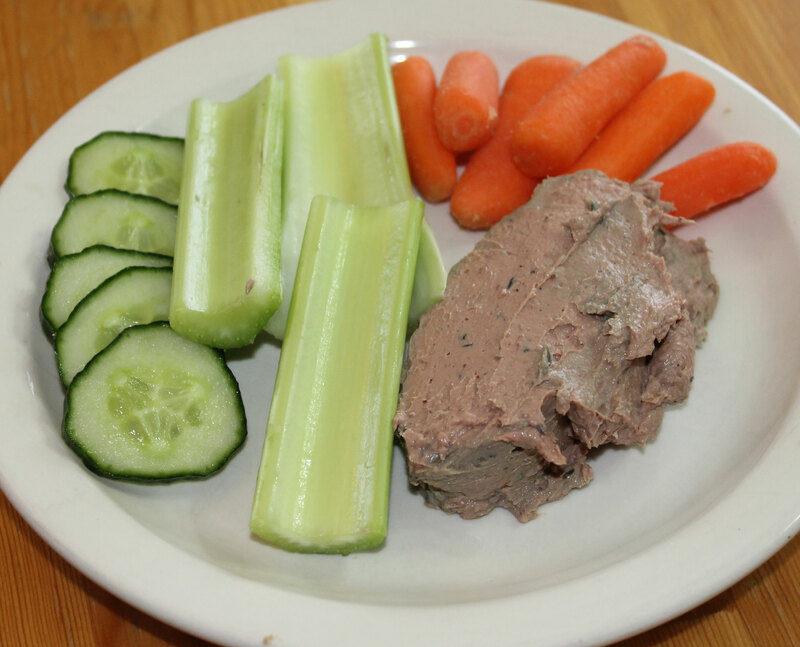 This is a good way to get kids to eat liver… my girls love dipping veggies in the creamy meatiness. I know what you are thinking though…. Pate should be served on toast. And toast is not Paleo or AIP-friendly. 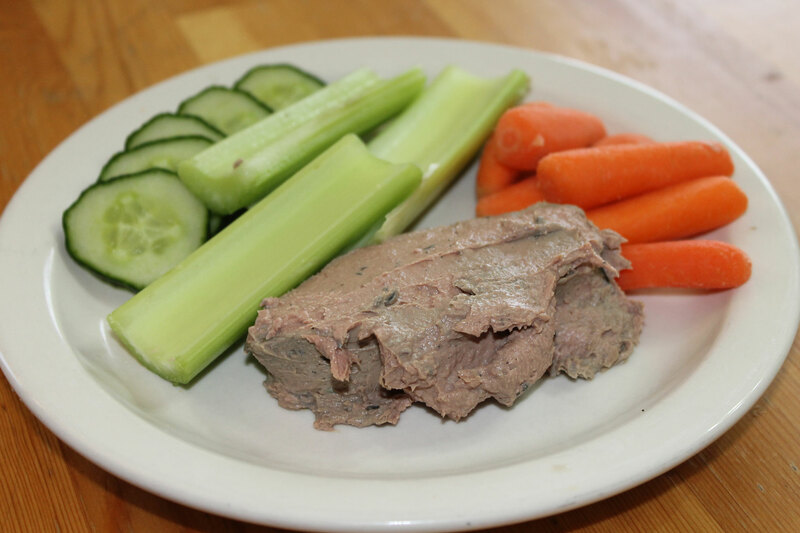 If you ate bread (even paleo bread), you could make toast and spread a generous amount of this pate onto it. 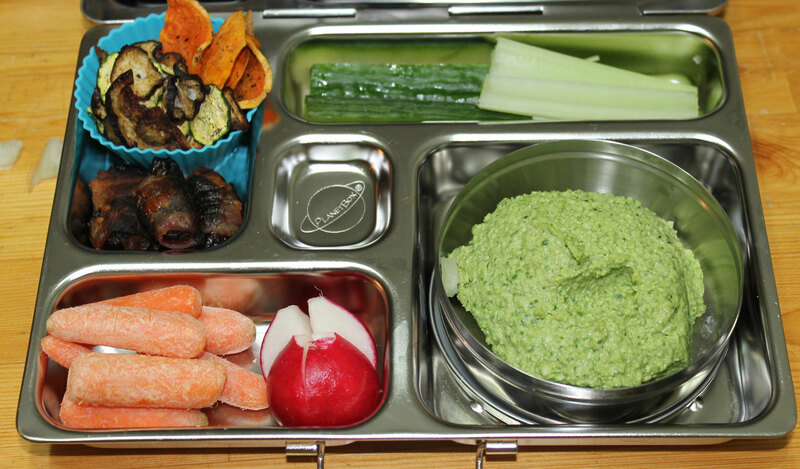 But seriously, it is just as good with celery sticks, baby carrots and cucumber slices. I will often spread it into the hollow center of a celery stick and make a savory version of “ants on a log”. YUM! 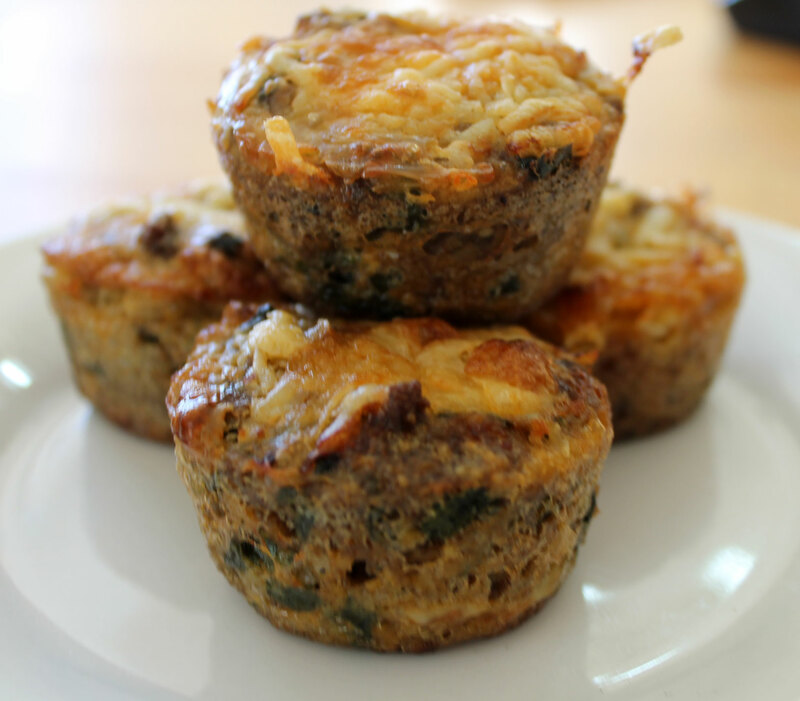 This makes a great appetizer or snack, but it could also be a quick lunch. And I have been known to eat it for breakfast as well! 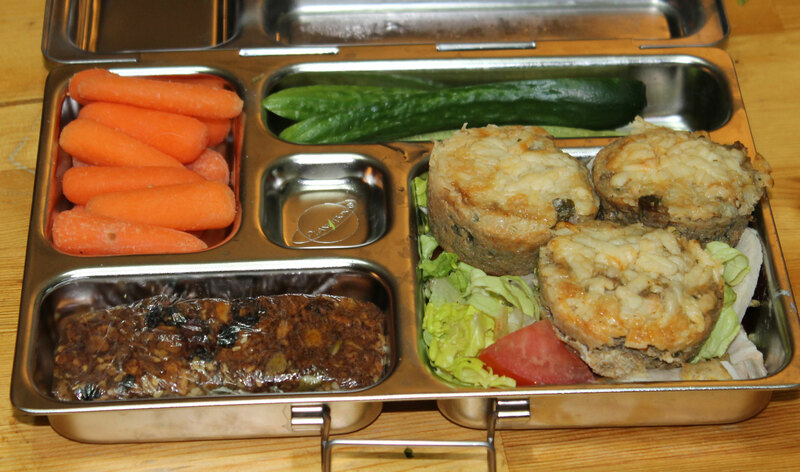 In this snack that I prepared for B, the radish slices take the place of crackers. And if you don’t have chicken livers, you could use any other liver you can get your hands on. Calves liver makes a delicious pate, but even beef or pigs liver would work. 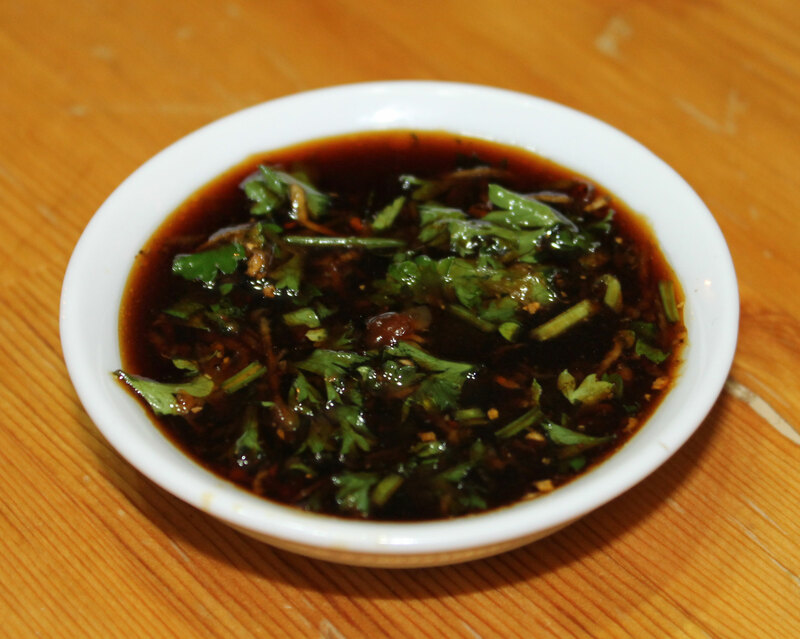 The flavour would not be so delicate, but it would be very nutritious, and would still taste good. Melt 2 tbsp of the cooking fat in a skillet and add the shallot and garlic. Cook over a low heat until softened. Add the sage, rosemary, thyme and bayleaf and continue cooking for about 10 minutes. Meanwhile trim your liver and if large pieces, cut into chunks. Add the liver to the pan and cook, stirring until it is browned on the outside but still pink in the middle. Add the bone broth and bring to the boil. Simmer for 5 minutes, then remove the bay leaf. Transfer the contents of the skillet to a food processor or blender. Add the coconut milk and remaining ingredients, including the leftover cooking fat. Pulse until everything is smooth, creamy and evenly blended. 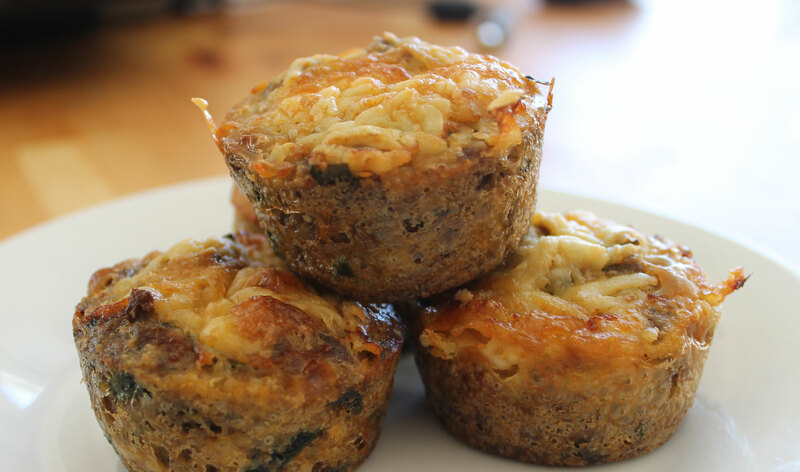 Pour into a serving dish and refrigerate until cold. To serve, scoop out the amount required, and serve. 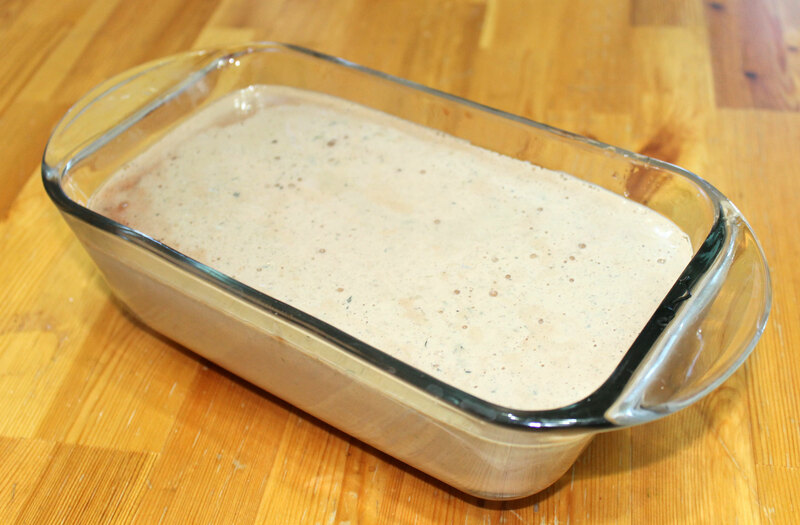 If you want to be able to turn the finished pate out and slice it, you will need to line a loaf tin with parchment paper before pouring in the pate. This will keep for at least a week in the fridge. 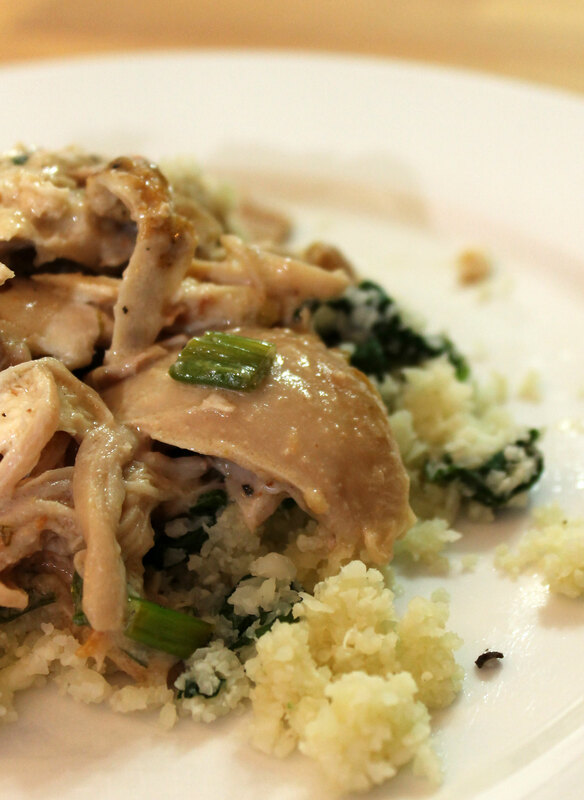 This is a quick, healthy and economical meal. It is pretty tasty as well. And all the ingredients are AIP-friendly, and suitable for the elimination stage as long as you don’t serve it with ketchup (Ketchup would be a stage 4 reintroduction because it contains tomatoes). 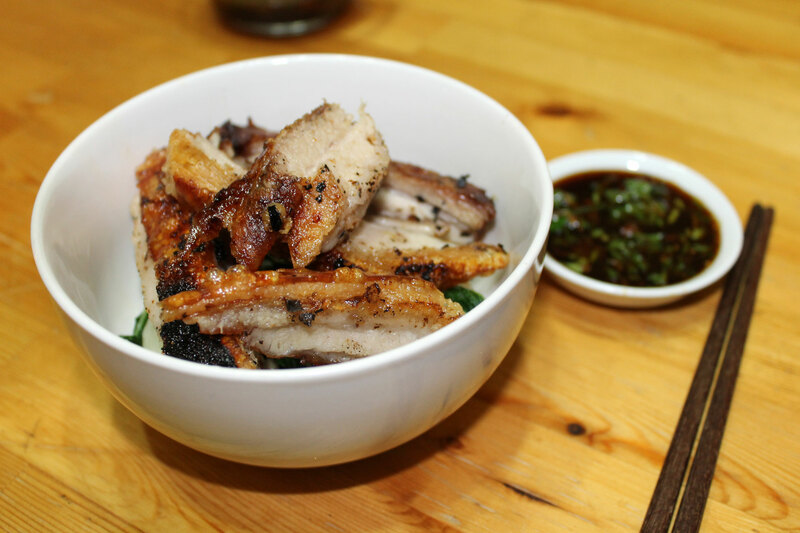 We eat this a lot for dinner, and there are usually some leftovers which are great for breakfast. Having said that, this would make a great breakfast all by itself. I pulse the mushrooms in the food processor for this. It means that they are very finely chopped and are hidden by the ground beef so that J (the mushroom hater) can’t find them. They still provide the same amount of nutrition and also add to the flavour. Chop the onion, and celery finely. Pulse the mushrooms in the food processor until very finely chopped. Dice the sweet potato and crush the garlic. Melt the coconut oil in a large skillet and add the onions. Sauté them until lightly caramelized. Add the mushrooms, celery and sweet potato and cook for 5 minutes. Add the ground beef and toss until browned. Now add the herbs, sea salt, broth, coconut aminos and balsamic vinegar. Toss it all we’ll and allow to cook for 10 minutes until the sweet potatoes are tender. Add the coconut flour and greens and cook for 5 minutes until the greens are wilted. 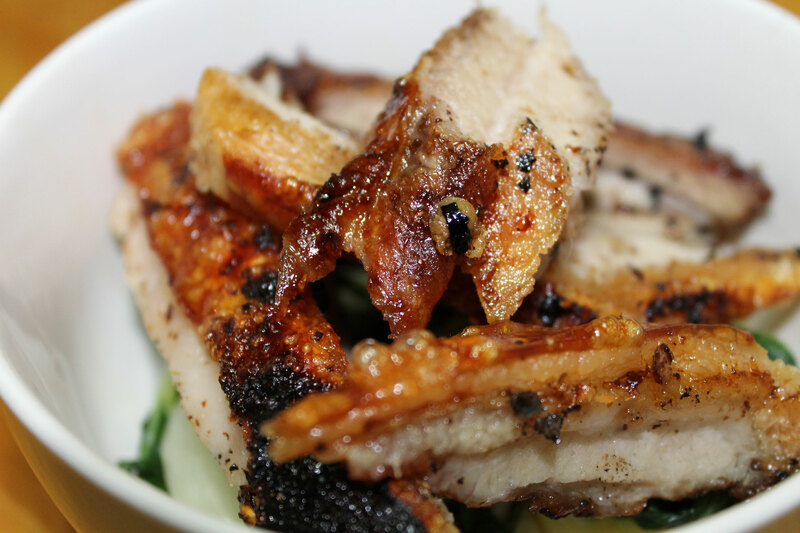 Taste and adjust the seasoning as necessary and serve at once. 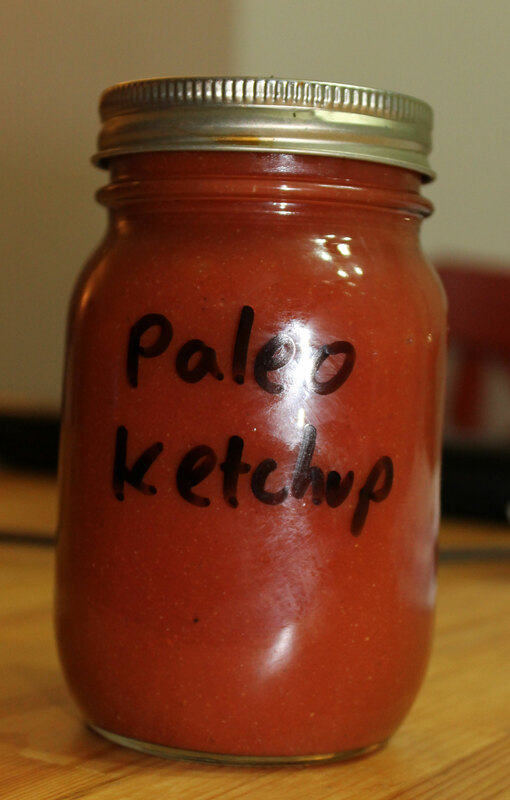 We like to serve this with Paleo ketchup (this is a stage 4 reintroduction, I just don’t have the ketchup and everyone else does). As you can see, J likes hash with her ketchup….. They also took fruit (a choice of mandarins, apples and banana) and a reusable water-bottle full of water. I can’t eat the energy bars (contain nuts, nut butter and seeds) or taco muffins (contains nightshade spices), so I took leftover soup, fruit and veggies for my lunch. This is an easy way to cook a whole chicken that leaves the meat moist, with a subtle flavour of garlic, lemon and coconut. This meal was cooked by A as I was working late and did not get home until 7:30pm. Dry the chicken sand season well with salt. Heat a heavy oven-proof pot on the stove over a medium high heat and. Melt some of the coconut oil in it. Brown the chicken all over, turning with tongs. Add the lemon zest, mushrooms, garlic, cinnamon stick and coconut milk to the pot. Cover and bake the chicken in the oven for 1 1/2 hours, removing the lid for the last 30 minutes to allow the top to brown. 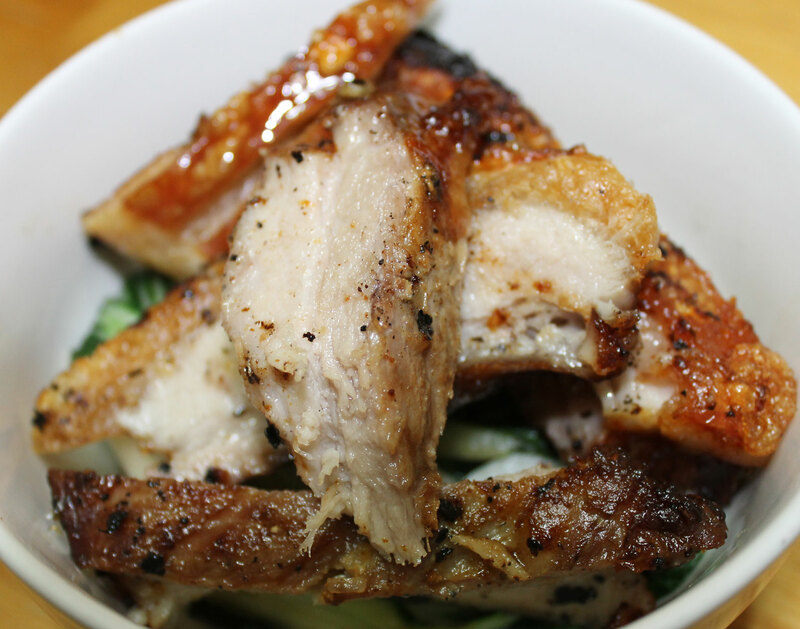 Remove the chicken flesh from the bones using tongs and add the chunks of flesh to the sauce e in the pot. Shred or chop any very large pieces. Add the lemon juice, green onions and parsley and gently heat it through. 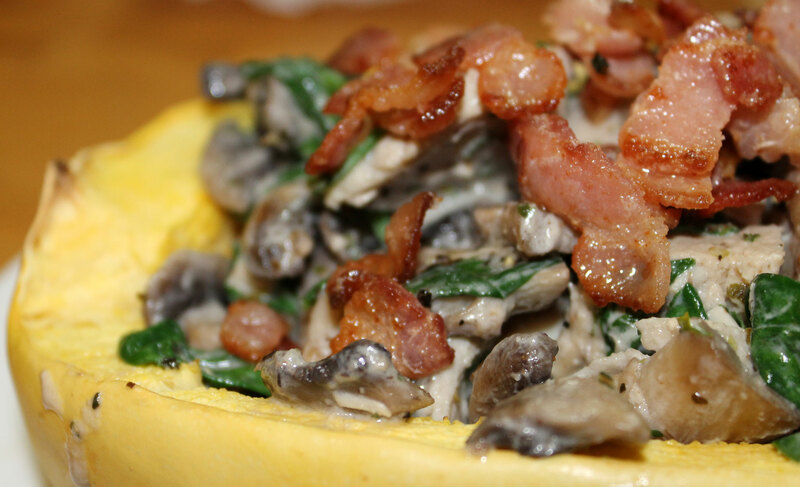 I mentioned in this post that I am fond of serving food inside a halved spaghetti squash because it saves me the need to actually shred the squash myself. 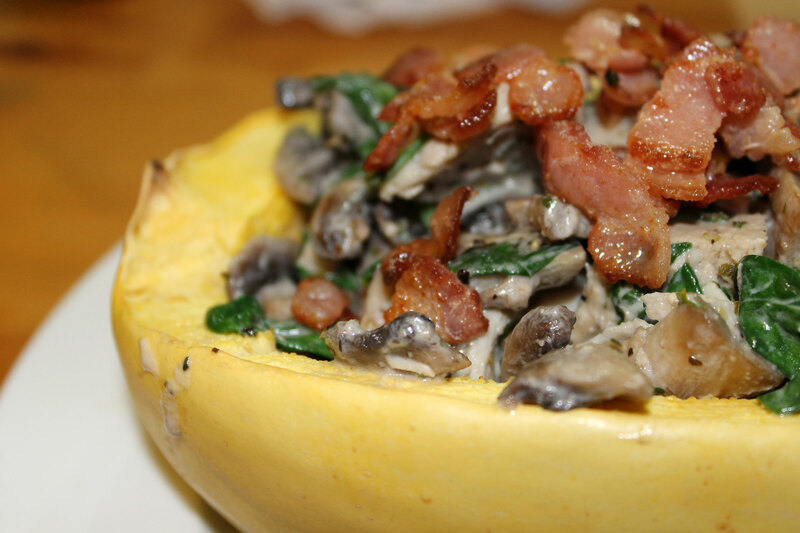 The shape of the squash makes a perfect bowl for serving, and as long as it is a smaller sized squash, it also makes a perfect single serving. The person eating the squash can shred it as they go and mix it with the sauce. 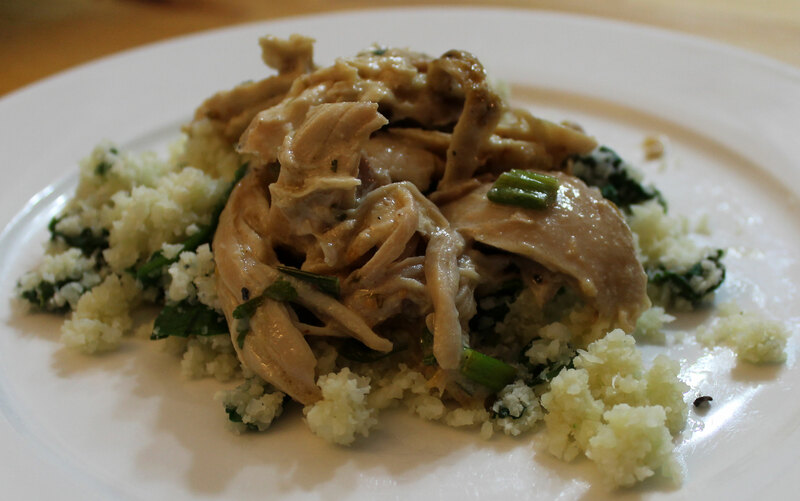 This meal is AIP friendly, quick, tasty and uses leftover cooked chicken breasts perfectly. Cut the spaghetti squash in half and scoop out the seeds and guts (save the seeds to roast as I mentioned in this post). Place the squash on a baking tray and roast in the oven until tender. This will take around an hour. If you are in a hurry, you could cook the squash in the microwave. Place the chopped bacon in a skillet over a medium heat and cook until crispy. Remove the bacon, leaving most of the fat in the pan and set it aside. Add the onions to the bacon fat and cook for around 5 minutes until translucent and starting to soften. Add the garlic and mushrooms and cook for another 5 minutes until the mushrooms are looking almost cooked. Add the chicken breast and spinach and cook until the spinach is wilted. Now add the coconut milk and herbs and season with salt. 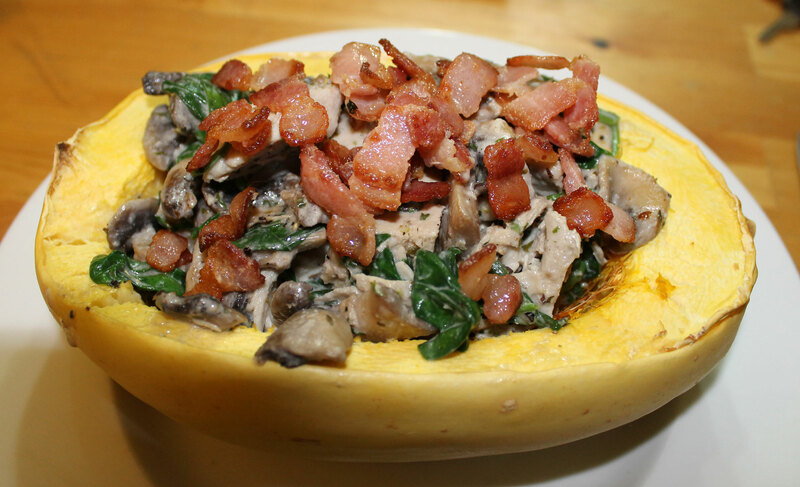 Toss everything around until it is all hot, and serve inside the halved spaghetti squash, topped with the reserved cooked bacon. It is also surprisingly filling. I could only eat half of my portion before I felt stuffed so I stashed it in the fridge for lunch today. We had roast beef on Sunday for dinner, so I had some leftover roast beef to use for dinner on Monday. I had cooked it so that it was beautifully rare, so I did not want to heat it up and overcook it. But I always think that cold roast beef needs some kind of sauce to go with it. 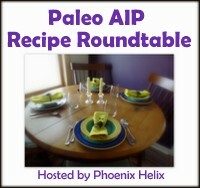 Due to me being on the AIP protocol, I cannot eat mustard as it is a seed, which is not AIP friendly. 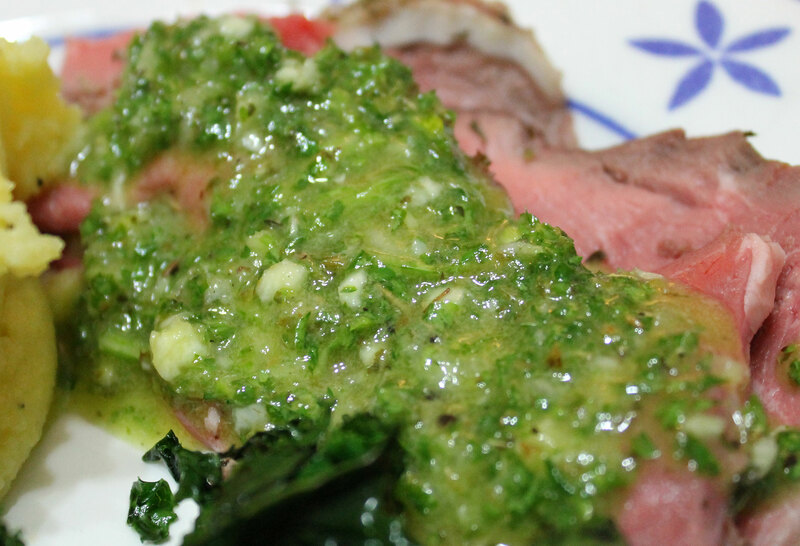 So I came up with this beautiful, green sauce that complemented the beef beautifully. 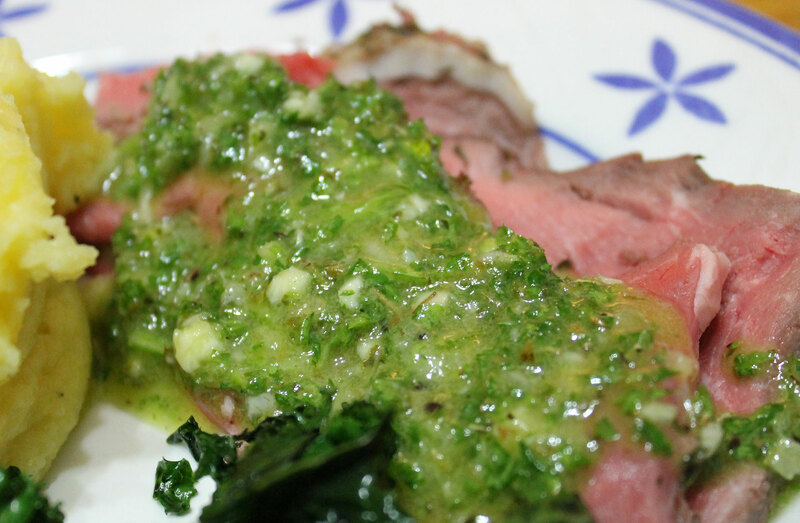 Don’t save this sauce to just serve with roast beef however. It would complement fish, shrimp or even chicken perfectly as well. 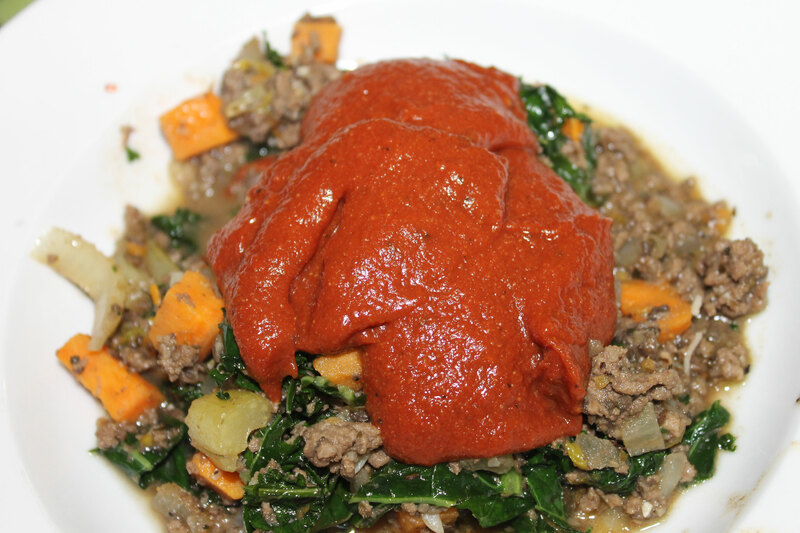 All you do to make this incredibly tasty and simple sauce is to throw all the ingredients in a food processor and pulse it until it is finely chopped. Chill in the fridge until required and serve over sliced meat, chicken or fish. 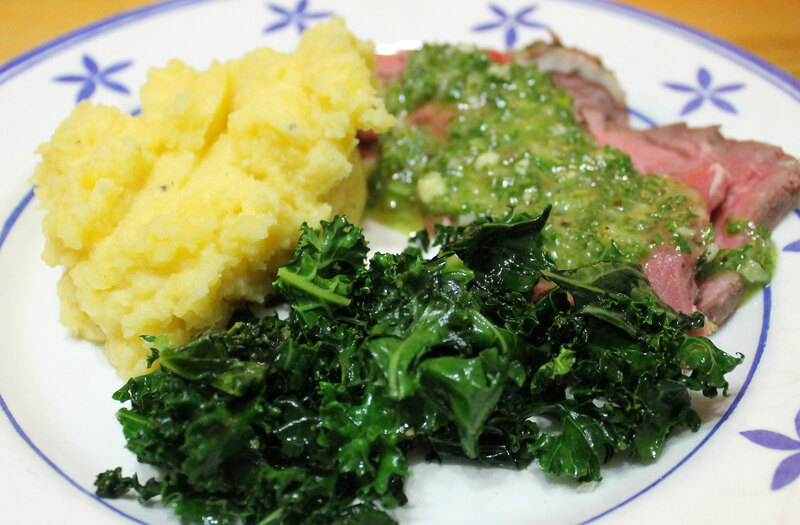 We served the cold beef and chimichurri sauce with rutabaga mash and sauteed kale and it was delicious.